Visit the Giza Pyramids during your layover at Cairo Airport with a private tour guide. 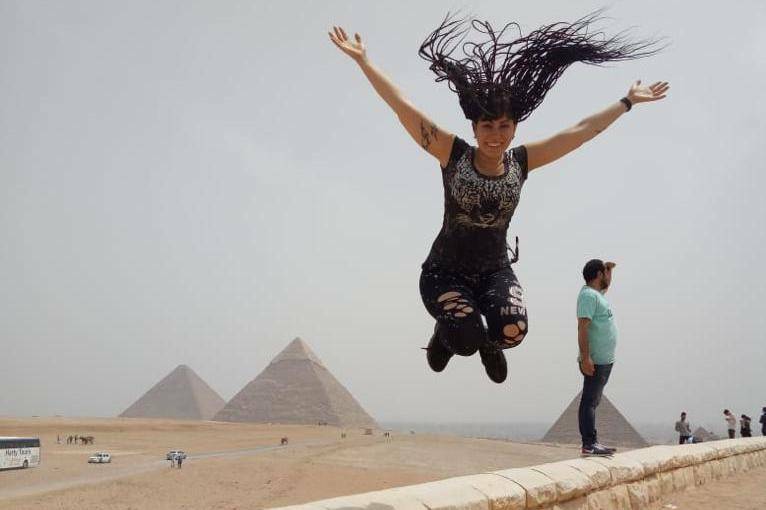 Once you arrive at Cairo Airport, get picked up by your guide and transferred to Giza City to visit the Giza Pyramids, the Sphinx, and The Valley Temple. If there is any availability, have a camel ride or enter any of the pyramids (additional fees). Your tour guide will be waiting for you at the Cairo Airport arrivals hall holding a signboard with your name on it. You will be transferred to Giza in a private, air-conditioned vehicle. Learn more about the Great Pyramids - Cheops, Chephren, and Mykerinos. Cheops is the most colossal ever built. Next, have a close-up look at the Sphinx. Visit the Valley Temple where the body of King Chephren was mummified. You will have the option to visit the inside of the pyramids or go on a camel or horseback ride (at an extra cost). Afterward, your guide will take you downtown where you will pass by Tahrir Square, the Egyptian Museum, and Cairo Tower. End your tour with a visit to Khan El Khalili Bazaar and buy a few souvenirs from the huge selection of fine brassware, copper, perfumes, leather, silver, gold, and antiques. Your guide will drive you back to the airport in time for your connecting flight.